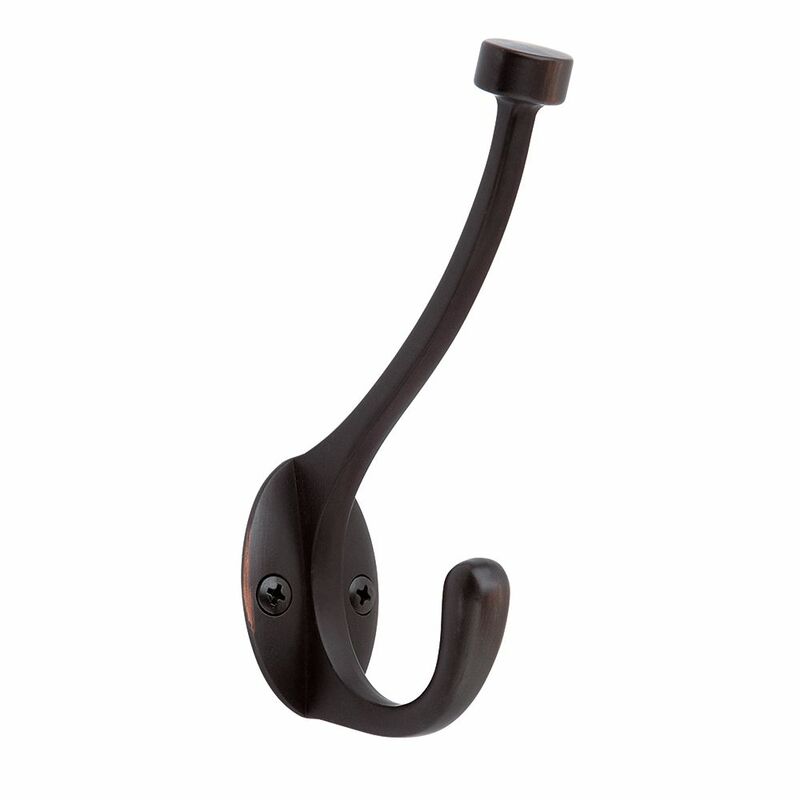 The Amerock H55465ORB Pilltop Coat and Hat Individual Hook is finished in Oil-Rubbed Bronze. Single hooks are most versatile and can be mounted into wood surfaces and drywall. The Oil-Rubbed Bronze finish is a rich, dark brown old world finish with striking light and dark accents. Organization with style has never been so easy. This wood rail with four metal hooks is designed to hold a wide variety of items coats, hats, handbags, umbrellas, towels or robes. This classic design is perfectly suited for any room from the entryway to the bathroom. From Liberty Hardware, the substantial Hammered hook offers maximum storage in a decorative package. The brushed oil rubbed bronze compliments the rustic design. Front mount installation makes adding this hook to your wall or door an easy task. Pilltop Coat and Hat Hook - Oil-Rubbed Bronze The Amerock H55465ORB Pilltop Coat and Hat Individual Hook is finished in Oil-Rubbed Bronze. Single hooks are most versatile and can be mounted into wood surfaces and drywall. The Oil-Rubbed Bronze finish is a rich, dark brown old world finish with striking light and dark accents. Pilltop Coat and Hat Hook - Oil-Rubbed Bronze is rated 5.0 out of 5 by 7. Rated 5 out of 5 by HomeDepotCustomer from Nice quality!... Nice quality! Rated 5 out of 5 by HomeDepotCustomer from We used these in our mudroom and were very pleased... We used these in our mudroom and were very pleased with the appearance. Rated 5 out of 5 by Andrea from These are exactly what we were looking for! Couldn't be... These are exactly what we were looking for! Couldn't be happier with their quality or their aesthetics. Perfection! Rated 5 out of 5 by Ap from Love these hooks they look amazing and are super functional.... Love these hooks they look amazing and are super functional. Rated 5 out of 5 by RaeTae from Looks great! I was looking for large coat hooks with a vintage industrial look. These worked great for my project. The screws that were included in the packaging were too long, so I had to supplement them with shorter ones (not a big deal). The price was great too...I found them at the local HD store and they were $4.95 each. They are heavy hooks and should stand up to lots of use.